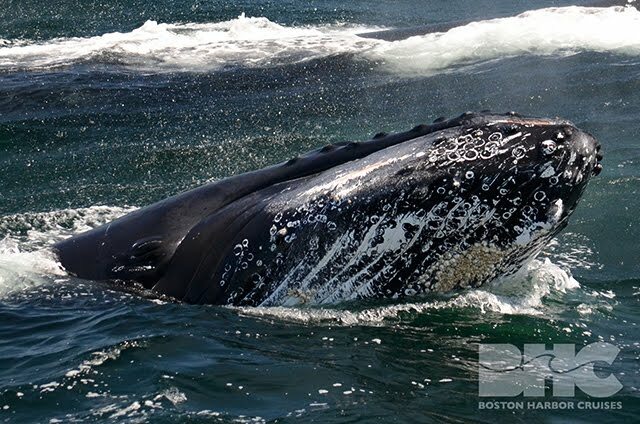 This morning aboard the Sanctuary we were pleased to again find a plethora of humpback whales on the southwest corner. 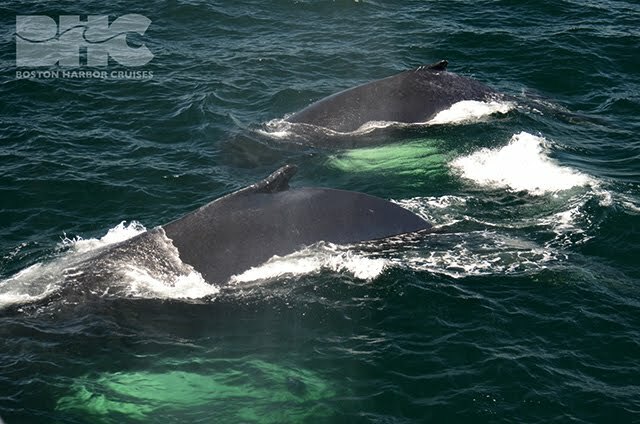 At one point, we were just surrounded by humpbacks on all sides! For a good portion of the activity, Captain Adam just kept the boat out of gear as we floated alongside swimming whales. The group composition and associations repeatedly changed as whales swam in and out of the area. Spending a good amount of time on dives while the calves milled at the surface, these whales were likely subsurface feeding. Among the various groups, we identified Perseid, Canopy, Hancock and calf (separately), Venom, Tear, A-Plus, Pele, Cajun and calf, Crisscross, Sundown, Sprinker and an unknown that has been around the past few days. 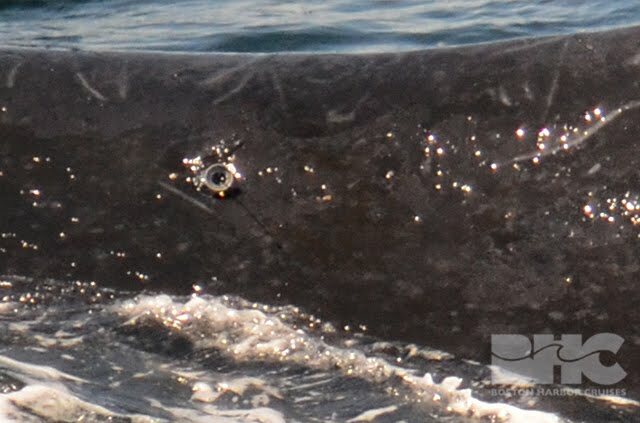 Venom was recently fitted with a satellite tag by the Center for Coastal Studies which we had a great look at today (see photo)! This tag might stay on for a couple weeks or a few months. We will continue to document these tags to help CCS assess physical and physiological responses to the tag. Take a look at the tracks here! Amidst the chaos, an adorable humpback popped its head out of the water seemingly to take a peek at us. Upon review of the photos, however, I realized that the little guy had his eyes closed the whole time! Nonetheless, this unique behavior gave guests a fantastic opportunity to check out its throat grooves and barnacles (see photo). 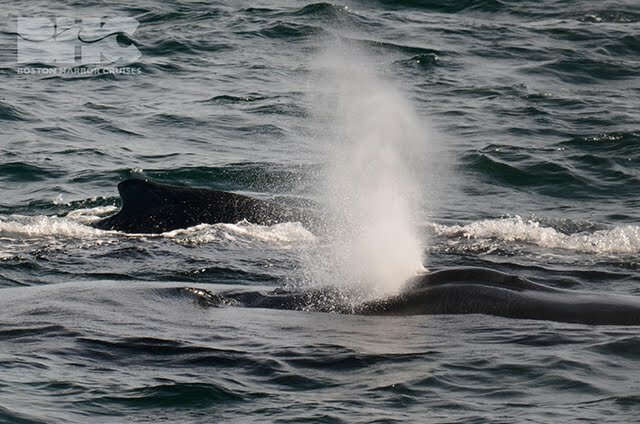 This afternoon, Connie and I switched over to the Cetacea with Captain Jim and crew and headed back to the southwest corner! Upon arrival, it was clear that the whales had spread out quite a bit. We came upon a solo calf that was soon joined by its mother, Jabiru. The two slowly made their way south as we cruised along nearby. We then moved on to Cajun and her calf who were accompanied by Snare. The trio were taking very long dives resting at the surface between. I was very impressed with how long Cajun’s calf was able to hold her breath! As opposed to milling about at the surface waiting for mom, the calf was participating in these long-winded foraging opportunities. As we made our way back to Boston under gorgeous sea and weather conditions, we were graced with the presence of a passing minke whale! It was an another absolutely gorgeous day on Stellwagen Bank!